In the 2012 Forward in Christ October issue (vol. 5, #2, p. 18), Fr. 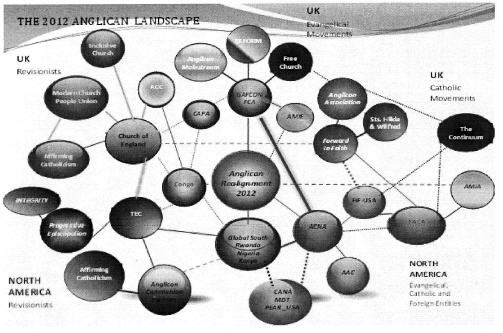 Kevin Donlon mapped various relationships and interconnections among both Canterbury-aligned and extra mural Anglican churches, lamenting increasing fragmentation and fission. Yet, Fr. Donlon believes disintegration can be reversed by “the shadow web” of often-conflicting and mutable “spheres of activity” within the Anglican Communion. Among the ecclesiastical bubbles (map to the left) inclined to cooperate, Donlon seems to think anglo-catholics might forge a New Oxford Movement to steadily reverse women’s ordination and other egalitarian disorders by the “fullness of catholic teaching”. As a consequence, liberal Evangelicals may soon find themselves on the defense against the mustering of Tradition for the reading of Scripture. While the ordination of women runs amok in Lambeth, the Jerusalem Declaration (FCA) is fast becoming the rally point for Anglican Communion conservatives. Collaboration between evangelicals and catholics was prefigured in America at the US Anglican Congress back in 2002 when Duncan’s AAC jointly celebrated Eucharist with catholic bishops from both FiFNA and APA. That event was credited for the making of Kingdom Norms — a new sentiment of cooperation among neo-evangelicals and catholics. The Jerusalem Declaration (as well as the ACNA’s Fundamental Principles) avoids issues typically divisive between these two camps. Yet, a path for correct hermeneutic has been opened. “The received Tradition of the Church and its preachings as set forth by ‘the ancient catholic bishops and doctors,’ and especially as defined by the Seven Ecumenical Councils of the undivided Church, to the exclusion of all errors, ancient and modern“. “Concerning the seven Councils of the undivided Church, we affirm the teaching of the first four Councils and the Christological clarifications of the fifth, sixth, and seventh Councils, in so far as they are agreeable to scripture“. Sadly, Anglicans ought to know how easily “plain” biblical proofs can undermine apostolic teaching regarding matters like bishops, fixed prayer, or male holy orders. An example of such is N.T. Wright’s recent scriptural ‘exegesis’ for women bishops in the Church of England. The evangelical-Anglican, Dr. John Stott, came to similar questionable conclusions, interpreting the ‘headship principle’ to allow ordained women to lower leadership positions given male supervision. Hence, women can be priests given the rector and bishop remain male. Perhaps there are two views of perspicuity at play between Evangelicals and Catholics? Evangelicals tend to mix critical with older grammatical-historical methods, resulting in an hermeneutic that is overconfident about the reading of scripture, especially on social issues. Meanwhile, Catholics tend to fall back on allegorical methods which need historical commentary or ‘holy tradition’ to reign in otherwise metaphorical creativity. It is interesting how approaches or philosophies about perspicuity impact ecumenicism, and Catholics tend to give evangelicals leeway, alloting evangelical progressivism to naivety or shoddy method rather intentional subversion of text/history. Indeed, Evangelicals can be superficial about historical commentaries kept by the church, and this is likely why the Jerusalem Declaration avoids language which might otherwise demand a stronger resourcement of catholic fathers (despite the ‘church being the keeper of holy writ’). The Declaration commends reading the Bible “in its plain and canonical sense” but only in such a way that is “respectful of the church’s historic and consensual reading”. Elsewhere, it says Anglicans ought to lend an ear to previous divinity since “We can benefit from listening to what they have had to say”(p. 32). “Orthodoxy in America has developed a theological center known as the ‘five fundamentals’. These are by no means the whole of orthodox doctrine, as many people mistakenly suppose. Instead, these five points constitute a common ground for all who are truly orthodox. But beyond this common ground lies an enormous area of Christian truth where orthodox Christians disagree vigorously”. The difference between 2008, when Dr. Thompson spoke (2), and 2012– when Canon Middleton lectured– is dramatic, and we might wonder if Middleton’s address signifies new direction for some GAFCON intellectuals.. ? Democratic Fix or Race to the Top? Whatever problems strident perspicuity has against traditional hermeneutics, the tension is further exacerbated by ‘experience’ or ‘reception’ added as criteria. African pentecostal-fundamentalism must wrestle with the Anglican Communion’s tendency to equate truth to democratic process or indaba (accompanied with plenty of bureaucratic string-pulling). The Windsor Report (p. 29) treats tradition as a ‘memory of earlier Christian interpretations’ with ambiguity, winking an eye to higher criticism when asking consideration for ‘large-scale historical reconstruction’ and the ‘nuances of ancient words’ while reading scripture. As usual, the Report could be read multiple ways. However, by dropping troubling phrases like– “being open to the fresh wind of the Spirit” (parag. 61) or, “Christians are not at liberty to simplify these matters either by claiming the Spirit’s justification for every proposed innovation or by claiming long-standing tradition as the reason for rejecting all such proposals”(par. 32)– the Windsor Report leaves solutions murky and Lambeth has yet to come clean on the relation between long-standing tradition, reception, and scripture. For the most part, the Report substitutes an otherwise solid hermeneutic for ecclesiastical procedure under the rubric of “reading the bible together”. This further politicizes theology, leaving “reception” to liberal Bishops (who dominate Communion offices) as the final test of authority. This kind of reception creates problems because ‘truth’ is squared by majorities (and worst by political hacking ) . Democratic procedure is not always certain since– as the Articles explain– ‘general councils may err’. Rather, concilar declarations ought to bear truth with fundamental doctrine, being neither “contrary or repugnant”. “Furthermore, ‘tradition’ must not be a coded term for the tradition of the Church of England, but must include the various traditions in the Communion formed by interaction of the Anglican Church with local cultures” (p. 65, Beyond Colonial Anglicanism). One problem with respectfully dubbing male Holy Orders as a ‘secondary matter’ is that secondary issues often have implicit errors on fundamental principles. Thankfully, the Jerusalem Declaration refrains from assigning WO to ‘adiaphora’. Rather, the Declaration keeps a tacit silence over deeper creedal and hermeneutical errors carried from ECUSA. “Keeping structure” until a study is finished is predicated upon error by ignorance. In a way, this ‘structure of cooperation” is an extension of the 1977 Port St. Lucie Agreement, allowing respective parties to buy time to resolve differences by serious study. ECUSA forced its civil rights agenda upon churchmen, so a study was never permitted. By restoring the original Port St Lucie understanding, ACNA has already done more than ECUSA– not only giving alternative oversight to parishes by their affinity in parallel jurisdiction, but provisioning a study that provinces pledge to act upon. Again, this is under the gracious assumption that liberals lack enough ‘facts’. But, ultimately agreement on hermeneutic is the only route forward. The recent ACNA task force on Holy Orders recently laid forth a plan for ‘discernment’ which will include other ACNA’s ecumenical partners (like the Russian Orthodox, OCA, LCMS, and Roman Catholics). The Task Force admits to, “addressing hermeneutical issues and the role of the Church’s Tradition in biblical interpretation“. Furthermore, the study is being conducted by the foremost opponents of women priests– the REC and FiFNA clergy– so it’s conclusion is likely to be a verdict against WO. Assent to the Jerusalem Declaration will be an important means by which faithful ministries and individuals will be distinguished from revisionists. As the Rt. Rev. Dr. Michael Nazir-Ali noted, “The Jerusalem Declaration is now the only game in town”. Moreover, please note that FCA membership is open to any Anglican who accepts the Jerusalem Declaration, including the members of continuing jurisdictions. The FCA is important, but must broaden its constituency and leadership. 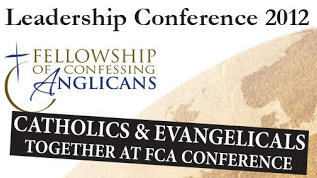 The FCA is and has been primarily led by evangelicals, whose initiative and hard work should be commended. However, to globally unify faithful Anglicans, it will need to include the full spectrum of (faithful) Anglicanism, including those who hold to its historic, catholic faith and practice. Over the course of the conference, Bishop Ackerman often reminded the FCA leaders about this reality. “Likewise, there seemed to be a convergence between FiFNA’s president and three visiting allies from England – Fr. Francis Gardom, Canon Arthur Middleton, and Canon Geoffrey Neal, all of them aligned with FiF-UK and the Anglican Association – about the need for another ambitious effort: A new Oxford Movement, and particularly another Tractarian Movement to provide new and reprinted publications needed at this time. Canon Middleton has in fact authored a work published by the Association, A New Oxford Movement, from which Bishop Ackerman quoted in his presidential address to the assembly”. Perhaps the 2009 policy of Society of the Sacred Cross (ushered immediately after GAFCON), limiting SSC membership to Lambeth-aligned clergy (scroll down to bottom), illustrates an impatience with catholics who refuse to join such networks (or bubbles)? New SSC membership requirements are punitive, and aim to pressure continuing anglo-catholics into Realignment organizations. Certainly, the FiF-UK leadership would approve. Other signs of greater catholic participation in FCA emerged in 2012 when Arthur Middleton delivered their keynote lecture. Middleton is the author of several books and papers on traditional hermeneutics as well as being the chair of the re-chartered Anglican Association. Middleton’s views on perspicuity have been discussed above. Likewise, FiFNA’s Declaration upgrade which now incorporates seven councils & sacraments, transforming FiFNA from a single-issue organization against women’s ordination into one committed to formal Tractarianism, closing a door evangelical inclusion (5). The move toward formal Anglo-Catholicism may also be a wink to the Traditional Anglican Communion (TAC), renewing FiFNA’s ratification the St. Louis Accord in 2002(6). Paul Hewett described FiFNA’s recent shift from single-issue to a greater ‘teaching role’ as instructing the “whole faith for the whole world”. This ought be read as ‘the fullness of the catholic faith’ which for too many anglo-catholics means adopting 7/7 formulas on sacraments and undivided councils. But for others, like certain elements in TAC, it obviously can go as far as signing the Roman Catholic catechism also being the “most complete symbol of faith”. That ‘whole’ or ‘completeness’ of doctrine is probably what Kevin Donlon is alluding to when he spoke about catechist and teaching roles for FiF among communion ‘bubbles’. GAFCON II gave an indication of Anglo-catholic strengthening when an attempt by liberal evangelicals to widen space for women presbyters (and possibly bishops) was blocked by conservatives. Described as a ‘behind the scene fight’, apparently traditionalists successfully watered-down the recommendations of the women’s mini-conference, replacing a commendation for female ‘leadership’ with a vague acknowledgement of women ‘ministries’. Some commentators have viewed the proposed language as proof of liberal contamination, but that should not surprise given the constitution of involved partners. The real significance was that liberal evangelicals (emboldened by Uganda) couldn’t push the concession through, and they may be less likely in the future as the alignments inside FCA alter (namely, away from Sydney toward America and the UK). Some Conclusions: Political alliances are naturally important since ‘reception’ leaves “truth” to the number of votes. Among GAFCON churches, neo-evangelical biblicism may be on borrowed time. If so, then more moratoriums on WO may arise rather than remain something peculiar to ACNA. Moreover, the widening of FCA (which is GAFCON’s theological group) to include continuing churches will not only multiply dual and backdoor relations between the Anglican Communion and extra mural Anglicanism, but it could further tilt the hermeneutic in an Anglo-catholic direction. Is a dialectic working? As the Anglican Catholic Church’s (ACC) ultra-orthodoxy putters away, proving an ecclesiastical dead end, broad-based continuing churches (like APA, ACA, EMC, and DHC) might rekindle curiosity about ACNA, starting with indirect ties like ministry partnership and/or cooperation through FCA. There might even be interest on the part of UECNA to join FACA or help make a FCA-friendly federation for continuers. Indirect ties to the Anglican Communion and Continuum already exist in places like South Africa and Tanzania where the Traditional Anglican Communion (TAC) has been cooperating with FCA since 2008. The addition of continuers is not unprecedented Indeed, it reproves the good-will commended by Section V of the St. Louis Affirmation. The opening of FCA to anglo-catholics will likely modify the theology of the GAFCON movement, and in so doing the continuum may play a constructive role within larger Anglicanism, especially as a new reformation or “new oxford movement” unfolds. This is not an impossibility given the St. Louis Affirmation and Jerusalem Declaration are not that far apart, both casting their own manner of doubt upon the proper number of councils. However, these questions begin to close as catholic groupings like FiF and TAC enumerate such by appeals to a higher ecclesiology (i.e., ecumenical talks with the East and Rome) not unlike the the review of history given in the Preface of TAC’s 2007 Porstmouth Letter. Where this leaves conservative Protestant Anglicans is still up in the air. Individuals, para-ministries, societies, parishes, and larger bodies can sign the Jerusalem Declaration here. (2) The question of perspicuity is interesting one with Sydney Anglicanism. Thompson went on to make his case for biblicism, mustering Cranmer ‘s Homily on Scripture, “This homily is in fact a celebration of Scripture as a ‘precious gift of our heavenly father’ …But it goes on to answer the suggestion that the Bible is too difficult to understand and that our ignorant reading may lead us into error rather than truth. In this context Cranmer provides us with the closest thing to an official Anglican statement on how to read and understand the Bible: ‘And if you be afraid to fall into error by reading of holy Scripture, I shall shew you how you may read it without danger of error. Read it humbly with a meek and lowly heart, to the intent that you may glorify God, and not yourself, with the knowledge of it: and read it not without daily praying to God, that he would direct your reading to good effect; and take upon you to expound it no further than you can plainly understand it […] Presumption and arrogance is the mother of all error… Therefore the humble man may search any truth boldly in the Scripture, and without any danger of error. And if he be ignorant, he ought the more to read and search holy Scripture, to bring him out of ignorance’. But Thompson conveniently skips Cranmer’s view on contention in the church (also a 1547 Homily) as well as Cranmer’s advice to the unlearned in the 1540 Bible, “If thou can neither so come by it [the meaning of scripture], counsel with some other that is better learned. Go to thy curate and preacher; show thyself to be desirous to know and learn, and I doubt not but God – seeing thy diligence and readiness (if no man else teach thee) – will himself vouchsafe with his holy spirit to illuminate thee, and to open unto thee that which was locked from thee.” Thompson’s view is the adiaphora of early Puritans. If a rule has no biblical injunciton, then matters of order are left to the individual or congregation, etc.. Whereas, Middleton takes a high-view of ecclesiology, extending not only in space but in time. Thompson doesn’t see any obligations in this respect. (3) It should be clarified that GAFCON represents the gathering of bishops who belong to the fellowship of confessing Anglicans (FCA). However, FCA is broader the GAFCON, including lay leaders and paraministries alongside orthodox Bishops. To make an analogy: FCA is to GAFCON I & II what the Fellowship of Concerned Churchmen (FCC) was to the first and “second” St. Louis Congress by which the ACC and, then, ACA were born. Between ACC and ACA, ACA has the better mind about keeping Section V.
(5) Another admission from Kidd’s article: “In brief, the FiFNA Declaration implicitly includes and then exceeds the points of the Jerusalem Declaration, defining a particular subset of Confessing Anglicans whose theological position tends toward the Anglo-Catholic, rather than the Reformed-Evangelical.” It is a sad commentary today that among continuing or extra mural Anglicans, the overall direction of conservatisim has been toward the ‘New Oxford Movement” rather than the 39 articles. In the effort to further woo continuers, the ACC’s Stahlism may ironically be legitimized. Meanwhile, the REC has been moving in an Oriental direction, sometimes treating the patristic period as the first millennium rather than the first five centuries. This a sleight-of-hand borrowed from Middleton and more typical of anglo-catholics. (6) FiF’s overtures (offering olive branches) to TAC and continuing Anglicans date back to the early 1990’s. Bess records, “in the immediate aftermath of the Lambeth Conference (Res. 1.10 in 1998), another resolution issued by the mainstream prelates offered an olive branch to the Continuing churchmen, calling for the Archbishop of Canterbury to initiate discussions with all of the groups who had become disaffected with the Anglican Communion, with the suggested goal of beginning a process that would bring most of the groups claiming an Anglican heritage back into communion with the Anglican mainstream. Seemingly buoyed by the world bishops’ endorsements of a plan to renew orthodox teaching in the Anglican Communion, the Episcopal Synod of America (ESA) emerged shortly thereafter with a new identity, calling itself Forward in Faith in North America (FiFNA), thus aligning itself with the body based in England. FiF had already signed intercommunion agreemetns with TAC (1994) and EMC, and FiFNA now joined in the agitation by FiF to have a separate province for traditionalists Anglicans…” p. 225. Evidently, GAFCON is on the verge of becoming such. This entry was posted in ACNA #2. Bookmark the permalink. The locus classcus on the number of Councils and their limitations is to be found in the Elizabethan Act of Supremacy. The number is four and the limitation is that all must be grounded in Scripture, Scripture trumps Tradition because all authentic Tradition is to be found in Scripture. I hope I agree with you. Let me clarify: I don’t claim Tradition is a source of doctrine either independent or equal to scripture. But, it should habitually inform our reading of the Bible, and I don’t think that’s exactly ‘optional’, especially when dealing with the marks of the church. These marks include discipline, and that ought to include the nature of the ministry (and therefore episcopacy, male orders, etc.). Holy Orders is wrapped up in the third note. Where neo-evangelicals are anemic is by neglecting Tradition where ecclesiology emerges. They tend to have a basically anabaptist approach. I think that’s active in GAFCON, but a broader movement might correct it. I actually went back and fixed the article a bit, changing ‘evangelical’ to ‘neo-evangelical’. I shouldn’t use such equivocations, especially since I think both “catholic” and “evangelical” deserve their historic etymology. In other words, ‘evangelicals’ properly understood would be confessional protestants, capable of dialog with the Augsburg, not modern-day pentecostals or charismatic-lite. In this sense, ‘evangelicals’ are indeed catholics, and the best sort. Also, in this article I used “catholic” in its popular sense, including that Newmanisque-Tridentine breed. That’s also probably too much a liberty, and I apologize. I hope those who read this post, suffering through the usual poor grammar, realize I’m speaking of anglo-catholicism and all its modern-day varieties. However, oddly, the anglo-catholics seem to be the most reliable opposition to women’s ordination (WO), and I think this has been a major cause for the REC’s convergence with FiFNA as well as a larger girding of Tradition with evangelical (GAFCON) hermeneutics, which I believe, is a needed answer to the neo-evangelical enthusiasm dominant in the global South. “Getting our act together: This means getting Anglican evangelicals and Anglo-Catholics together on the same page, globally, with reforms such as conciliar governance: governing in accord with the patristic consensus. There re some 35 million Anglicans who claim to be Bible-believing, and our various provinces and jurisdictions are like ships that need to be in convoy together”. For ACNA this ‘convoy’ is keeping parallel jurisdictions until the ‘methodology’ or ‘ethos’ is laid to resolve substantial differences resulting from the lack of discipline since WWII. This has happened in many respects, and now they are moving toward a serious study and possible moratorium. There is a lot of thought going into “how to keep Anglo_Catholics afloat” which always seems to end up with an elephant graveyard. Why not just admit that the experiment of being “catholics by ourselves” does not work. If we can see that Western Canterbury Anglicanism has failed because of abandoning Holy Orders, why can’t we Catholic Anglicans admit that our experiment of independent Catholicism has failed as well? Catholic Anglican’s legacy in the Anglican Communion will be that we gave Broad Churchman the one thing they needed to destroy the Communion: historical legitimacy. We gave them the “feel” of Catholicism without the Faith so when they abandon the faith they could look Catholic in doing it. Why not just move on and enter into communion with Rome or Orthodoxy? There are a lot of words here to try and make sense in how we can be in communion with people that don’t share but maybe 10% of the faith we do, why not just humble ourselves and come into communion with people we share 90% of the faith with? It does not make sense anymore to stay separated from the Patriarchs in attempts to be in communion with people that fundamentally disagree with us and will continue to schism among themselves. Dale, If GAFCON and ACNA don’t work out in the next few years, I think a lot of catholic Anglicans will end up in either the Roman or Eastern Church. However, the Ordinariate and Western Rite provisions are currently wrestling with outlying problems which beg solution before Anglicans will risk big moves. The recent ‘shake-up’ of the Russian Western Rite is a good example. There has likewise been expressed disappointment with the Ordinariate. I think all observers agree such that sister-church provisions for wandering Anglicans are not built in a single night but will take time before they reach a kind of critical mass or produce a butter-fly effect. The usual projection is 5-10 years. Even the independent, old catholics Anglicans, like ACC, have predicted a five to seven year wait before the consolidation trends within the continuum fully manifest. Oddly, I think we’re all on a five or ten year plan, but I’d like see where this goes before making a final judgement. Meanwhile, my family will be buried Protestant, and we’re preparing an independent, family-centered strategy, if need be, in order to remain Anglican. Securing apostolic succession within my own family would be one way to dismiss ecclesiastical politics. However, while these jurisdictions still exist, I am an ACNA and REC cheerleader but prefer keeping a healthy distance until secondary or cultural questions are there resolved. Given the makeup of the ACNA bicameral houses, I am hopeful. Yet, my own preference for assurance of orders would be through the FPEC while keeping cooperative ties to AOC or UEC, gradually building relationships with FACA churches. I really advocate indirect ACNA involvement with more pragmatic, long-term expectations on my own family. An excellent example of the coming resourcement: The Anglican Association (mentioned in the post above) wedding UK tractarians with the Free Church of England (FCoE) as a parallel body in Britain. There is also the curious alliance with the greater Union of Scranton. I believe we may expect something similar arising in the USA between REC and FiFNA partners, adding pressure to ACNA liberals. This booklet was evidently put together by Middleton and Fenwick for discussion.